I am having so much fun drawing birds this year! I had no idea I would be drawing so many birds in this alphabet challenge I’ve got going on. I do love them though, and always have. Growing up, we had an Audubon book that came with a spiral-bound booklet of thin (foldable) plastic records. If you were curious how a bird in the book sang, you could play the track. (I’m dating myself, this was back when every home had a turntable!) It was so cool. I was fascinated by that book. I have always admired people who can turn what they see through a camera lens into artwork. Photographers here on WordPress (and elsewhere) are so gifted, and their blogs inspire and juice me daily. For the letter K tomorrow, I’ll be taking a stab at a body part. Of a human, not a bird this time. This little sketch took 25 minutes. I encourage all of you to celebrate our natural world, in any medium. You’ll start to see the world in a completely different way: more like a child. It’s a beautiful thing. I hope you’ll stop by again tomorrow. 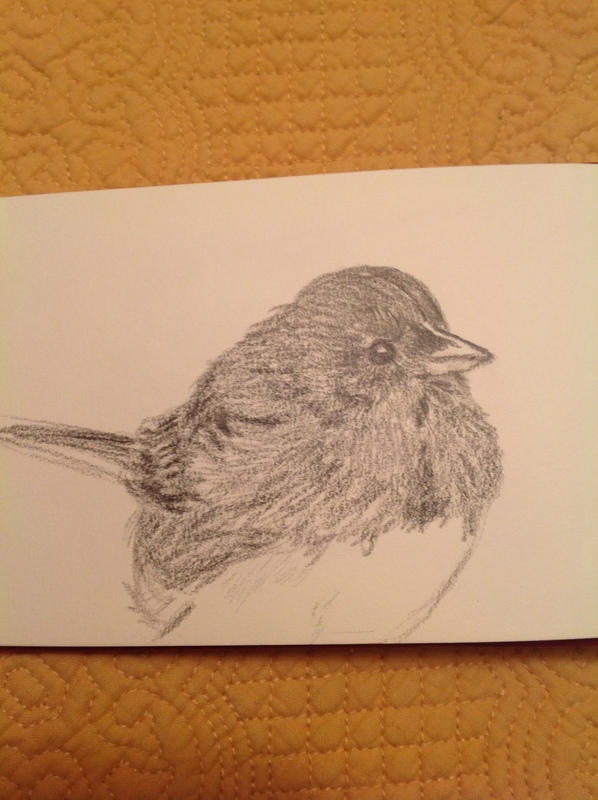 Love this sweet little bird — both the photo and the drawing. You are soooo dedicated. Can’t believe you can turn out so much art! thanks for inspiring me! What a great idea – creating art with inspirations from Paint my photo – it’s kind of like collaborative art making! Thank you. In October, I was trying to become a watercolorist, and the preliminary drawings took longer than the paintings. So I decided to back up and learn how to draw. After busy season is over at work, I’d like to get back to WC with more confident and faster drawings. PMP helps me to get the detail I’m trying to focus on to become better at drawing, but it’s my intention to produce original artwork, either from my own photos or using photos as references to make something completely new and different. Thanks for stopping by. Thanks so much! It’s amazing how you improve when you draw every day. Never thought to make it a priority until I decided I need it for balance. Now, I’ll never go back. Thanks again for all your great comments, Cassie. I’m glad you found me, too. I’m so glad you approve of my junco drawing, since you love them so much. It’s nice to be able to inspire people. So many have inspired me, and continue to. I’m going to check out your blog also. Thanks again for following me. 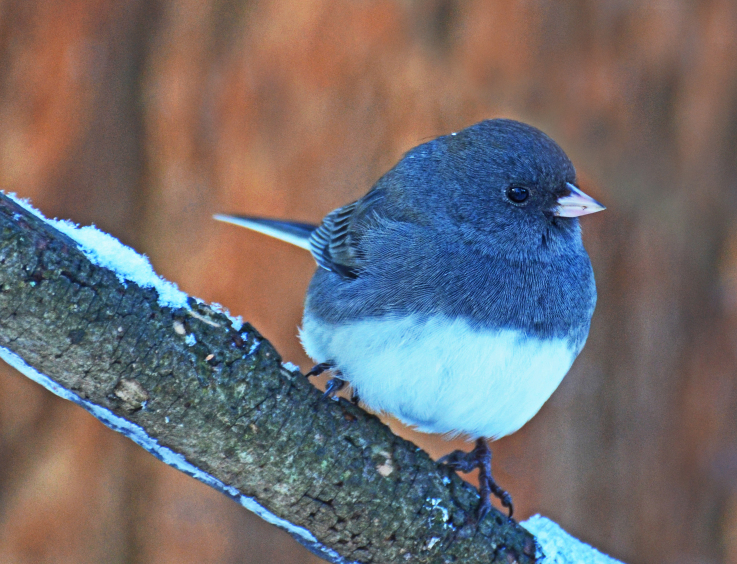 You did such a nice job in this junco. And i like that you loaded the image first in the blog post. You are sticking with the daily practice. good job! I’m so glad you liked him. I enjoyed drawing him too. I may try bird and people feet when I come back around to F. Or maybe for toes (T). Thx for the encouragement. Oh neat! Didnt know you were going to repeat the alphabet. Yeah, at least through tax season. It just helps me figure out what to draw next. I wanna draw everything in sight, so it keeps me focused, I guess. I’m gonna try and change up the next alphabet a bit, though. Keep it fresh.